14-01-2013 With clear skies forecast for our Tuesday evening meeting at Alderminster Village Hall we are planning to continue our Stargazing Live efforts. So (weather permitting) we will be getting our telescopes out to view the lovely dark skies in Alderminster. However, do wrap up warm if you're planning to join us as the temperatures are likely to be well below freezing! (We'll be serving hot drinks in the heated Hall). 13-01-2013 20:40 We've had about 50 people here looking at telescopes and talking about astronomy. We can now just about see Jupiter and a couple of stars but it's now snowing! 13-01-2013 18:30 Unfortunately the weather isn't behaving tonight and so we are not doing any observing because it is completely cloudy. We do have 5 telescopes set up indoors that we can tell visitors about as well as introductory talks. 12-01-2013 20:50 We've had a dozen or so visitors tonight viewing Jupiter, and the Andromeda galaxy, however because of the clouds we have not been able to see much else and we are calling it a night. We will be back tomorrow and we are hoping for better weather although some forecasts are indicating that it might be cloudy. We will have a full range of activities tomorrow including introductory talks. 12-01-2013 18:30 We are back at Snitterfield Sports Club, but tonight we are in the bar. It is pretty cloudy outside but we can just see Jupiter although it is quite cold. 11-01-2013 23:30 Tomorrow evening (Saturday), we are unable to use the main room at Snitterfield Sports Club and the weather forecast is not promising for observing. Hence the post from 05-01-2013 saying that we would not be able to run an event. However we will be in the bar at the Sports Club and although we won't be able to the full range of activities we will be there to talk about astronomy and telescopes. If we do have any clear weather we will be able to get the telescopes out and observe. Published weather forecasts still indicate that the weather may improve for Sunday. 11-01-2013 20:10 Unfortunately it has now clouded over. 11-01-2013 20:00 It is still clear and we are still observing with around 100 visitors. 11-01-2013 19:00 Despite yesterday's weather forecast, we can see stars! It was very clear half and hour ago, although it is now a little hazy. We do have telescopes out observing right now! 10-01-2013 Following discussions with the Met Office, it appears that the weather on Friday is unlikely to be good for observing. Nevertheless we will have a range of activities in the clubhouse for young and adult visitors. Members will provide information, literature and help and advice. This will include hands-on demonstrations of various telescopes and advice for owners or potential owners of telescopes. Copies of the excellent 24-page Star Guide created by BBC2's "Stargazing Live" team will be freely available for all, including ample copies for teachers and group organisers who turn up on the evening. Additionally, we will provide advice and help regarding astrophotography, astronomical software, etc. We look forward to seeing you! Published weather forecasts indicate that there may be some improvement in the weather for Sunday. 05-01-2013 Due to circumstances beyond our control, we will not now be hosting a Stargazing Live evening on Staurday 12th as was previously advertised. Following the great popularity of "Stargazing Live" in 2011 & 2012 the BBC and Professor Brian Cox will again be hosting exciting TV programmes on astronomy in January 2013. Stratford Astro will again run a range of interesting activities for people of all ages, free, on Friday 11th and Sunday 13th January, at the Snitterfield Sports Club. So, this will be an opportunity for you, your friends, children, to see planets, moons, galaxies, the Milky Way. We will talk to the Met Office in the run up to these nights and choose one as the Main Night for observing and activities in the clubhouse. In the event of cloudy skies we shall use the Sports Club to show you videos, telescopes and discuss topics of Astronomy and Cosmology. It is hoped that the BBC will again back us with helpful booklets and other materials for visitors to take away - these have proved to be of interest to people of all ages. 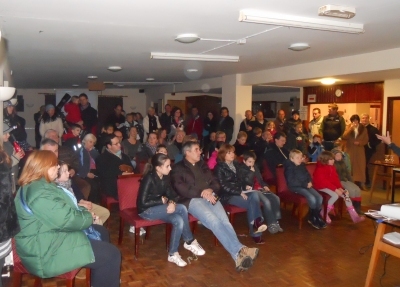 In both 2011 and 2012, Stratford Astro followed these programmes up with a "Star Party", at Snitterfield Sports Club. We had great nights with around 200 people attending on the clearest night. The photo on the right shows one of the indoor briefing sessions we hold to brief people about what can be observed that night, so as to make their skywatching more effective when they go outside. There will also be experts available to help visitors with advice about astronomy, telescopes and any other questions visitors may have. More details of the 2013 event will become available week by week and we will "spread the word" online via this site, Facebook and Twitter, so please keep an eye on our news. Snitterfield Sports Club is an excellent venue for these events because it is located in an area that is much less light-polluted than many adjacent districts and offers a wide panorama of the sky. The Club also offers a full range of facilities including a licensed bar. Hot snacks and drinks will also be available on the stargazing nights. 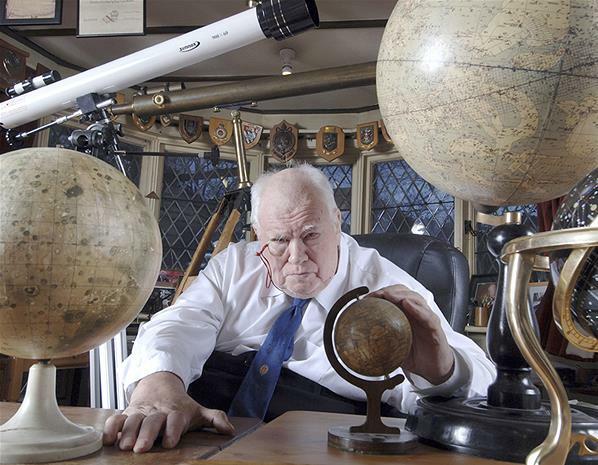 The Stratford-upon-Avon Astronomical Society is dedicating this event to the memory of Sir Patrick Moore, an amateur Astronomer who through his enthusiasm, numerous books and his BBC Sky at Night programme inspired many of the amateur Astronomers in this country. We shall miss him but shall continue observing the Universe as he would expect us to do.